CONCORD, N.C. — Weather stemming from Hurricane Matthew has forced NASCAR to cancel all on-track activity for Friday at Charlotte Motor Speedway. 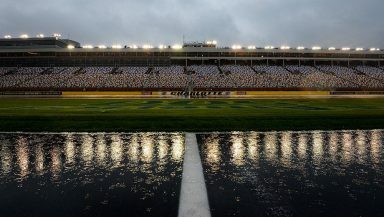 Constant rain showers around the greater Charlotte area has led to the Drive for the Cure 300 NASCAR XFINITY Series race, which was originally scheduled for tonight, being postponed to Sunday at 11:00 a.m. It will remain on NBCSN and PRN. Two Sprint Cup practice sessions and XFINITY qualifying that were also scheduled for today have been cancelled as well. The lineup for the XFINITY Series race will be set by practice speeds, per the rules. The Bank of America 500 for the Sprint Cup Series remains on schedule for Saturday night at 7:00 on NBC and PRN.